This is a sponsored post for Teespring. The opinions in this post, however, are 100% my own. I will be the first person to tell you, I hate being in charge of fundraisers. Don't get me wrong, I am all for throwing myself into a cause and I'm out there helping with everyone else. To me, it's the logistics that kill me every time. Years ago, back when I was still in college, I was the treasurer of my college's little Habitat for Humanities chapter. While we always had big ideas, we never were able to pull in the funds to do anything other than help with labor. One year, we even had this cool idea to sell t-shirts. Even though this seemed like a cool idea and we had the design, it quickly fell through when we discovered the costs. Now, nearly a decade later, I am amazed at all the cool things out there for non-profits, including a fun company I just learned about recently – Teespring. Never heard of Teespring? It is a new, innovative way to make t-shirts for fundraising or just to make extra money. Normally, to make t-shirts for whatever cause, you have to design a shirt, decide how many of each size to order, and then pay costs upfront for each t-shirt. While some places have great success with this method, others are left with extra t-shirts and actually end up losing money. Even worse, the t-shirts are usually poor quality, making them even harder to sell. 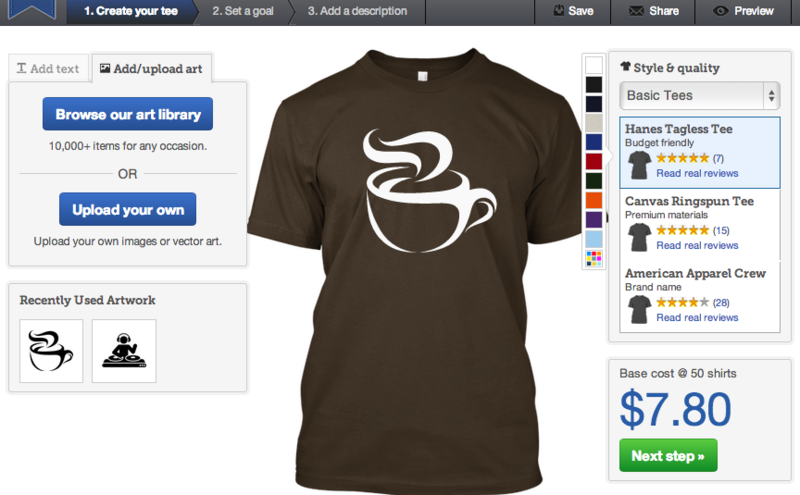 With Teespring, you design your shirt online, and set how many you would like to sell before they start printing. Once your goal is met, they start making shirts, allowing you to make a profit without paying anything to Teespring. Best of all, your customers order directly from the site, meaning you don't have extra shirts laying around. Really, Teespring is a non-profit's dream come true when it comes to t-shirts! Even though I love to play around with drawing, I'm not very good at it. For this reason, I always need a program that is rather…well…intuitive. TeeSpring's design center is very easy to use, allowing you to use some of their own clipart to make shirts, or the ability to upload your own. This allows you to make the perfect shirt for your campaign. You can even control what colors will be used during printing to cut costs even more on each of your shirts. Personally, I love that you can choose between a variety of shirts, letting you design a top quality shirt that everyone will be proud to wear! Based on what I have seen from their website, I have say that I am impressed with TeeSpring. I know that if I ever have to make t-shirts again for an event or fundraiser, I will definitely be using their site. Likewise, if you are someone who plans on making t-shirts anytime in the near future, I highly recommend giving TeeSpring a try, I don't think you will be disappointed! Disclosure: Budget Earth's writer received monetary compensation for this review via Sverve & Teespring. All of the opinions on this article and blog are the opinions of said author and these opinions may differ from your own. I will definitely keep this website in mind for the next football fundraiser! These are a great deal, and what a great idea. I'll keep them in mind for our TNR activities! Great tip. Thanks for the advice. I'll keep this in mind for some promotional ideas. I am a little confused by some of the details like how you can have the shirts ready for an event if you don't yet know how many you will need? This would make a great fundraiser for my Church's fall fest. These would be economical for people to wear who are promoting the fest. What a great concept. I'll have to try teespring out. Loved reading your review. An organization that I belong to just used TeeSpring to make shirts. Our orders just closed yesterday and we're excited to get them and see what they really look like! Awesome! I would love to see a link to what your shirts look like! Wonderful idea! This really lets you customize and make the shirts your own. Good to know that they are high quality, too. That sounds like a good idea. I'll keep them in mind. Thanks. I had never heard of this company. I will mention it to my daughter who is in charge of her school events.